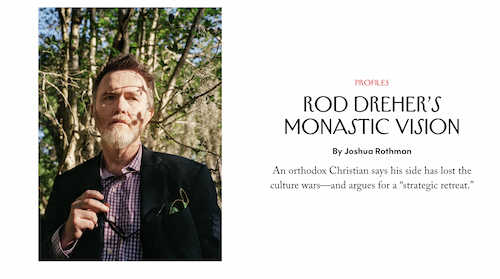 I dunno; the New Yorker piece seems to make it pretty clear that this is not some gimmick Dreher dreamed up to move books, not in the way that the headline of that piece was dreamed up to attract clicks, anyway. It was born of his life experience – the experience of moving his family for the sake of some perceived good outside of the economic. And saying that something is somehow not a thing simply because it finds its roots in the Gospel seems remarkably thick. Every authentic religious movement finds its roots in the Gospel, no? The movement is a response from people rooted in the Gospel to the conditions of their particular times. Given that American Catholics have spent the past half-century happily assimilating and believing that it was the way to go, that we could transform the cultural stew by marinating in it, Dreher’s message – and its reach – strikes me as remarkable. That said, once you get past the headline and grabber, it’s a good piece – a defense, even!